SPAM filters, blacklists, sender reputation, trigger words… all those phrases run through email marketers’ minds when we think about email deliverability. While those are all critical factors that will impact deliverability, one aspect that is often overlooked is the email file size. The size of your email plays a significant role in whether your message makes it to the inbox and how it looks once it gets there. There are many different (and contradictory) recommendations floating around the web for what the max is for email file size before it negatively effects your inbox placement. That’s why we dug up current file size recommendations circulating around the web, then did some testing of our own to find the “perfect” weight for your email. At what point does email file size cause deliverability issues? Reports vary when it comes to email file size and deliverability. The V12 group says the overall file size of the email should not exceed 50 -70KB while Responsys recommends total email size be limited to 125KB (and that’s just a few of the recommendations we found). By leveraging our SPAM reporting, which tests against 23 of the most popular SPAM filters, we found that sending a file size between 15KB-100KB is A-OK. These emails successfully passed through all our SPAM filters with flying colors! CheetahMail ran tests on file size and deliverability as well and found identical results! Our conclusion was validated by their study as they found that a file size of 100KB will make it to the inbox if you are sending to Gmail, Yahoo!, AOL or Outlook. It’s better to be safe than sorry, so keep it under 100KB peeps! From this research, we stumbled upon another query: “Does the size (in terms of KB) of images have the same effect as the email file size?” Some resources warned images that exceeded 20KB will get flagged as SPAM while others said images that are under 50KB are good to go. To test this theory we created 4 emails with 16, 84, 146 and 696KB images to see what effect it had on deliverability. We ensured the images were hosted on our site to avoid IP reputation problems on other servers. We found that image file size did not have any impact on deliverability. Based on our test results one should be more concerned with the size of the email vs. the size of the images. However, it is important to note that using overly large emails without any supporting text in your email can raise a red flag for SPAM filters. This is because spammers usually display information in large images instead of text because the filter programs cannot “read” the content. If you stick with a 60/40 text to image ratio, you should avoid having deliverability issues. Deliverability isn’t the only issue that can occur from email file size. Sending extra-large emails can cause your full message to not appear in its intended glory. For example, the Gmail app for iOS has a nasty habit of “clipping” emails, or cutting their content short and adding a button that says “Download entire message.” We have also seen this on Gmail for Android. This could potentially hide an email’s main content or call to action, but really any extra step a reader has to take is a huge stumbling block to the success of an email campaign. We’ve created a “cheat sheet” on how to avoid this issue, so be sure to check it out. On top of email clipping, large emails also affect load time. Emails with a slow load time are more likely to get deleted than light, small emails that display in a jiffy. Your readers are inundated with hundreds of emails a day so the chances that they’ll sit patiently and watch the rainbow wheel load is unlikely. It is also important to note that emails with a large file size load even slower on mobile than on web or desktop. Not to mention, larger images will eat up valuable megabytes in limited data plans. With about 20-50% reading email on mobile, we carefully design emails that will accommodate the limited data plans, slow networks, and various behaviors of the mobile email clients. Remove any unnecessary spaces, carriage returns or comments. 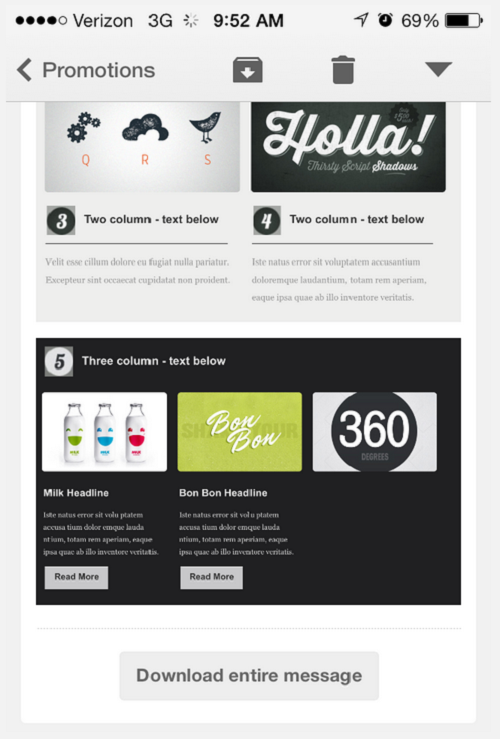 Make a landing page so all of your text and images don’t have to all fit in the email! You shouldn’t waste your time crafting a perfect email if it’s never going to end up in your subscriber’s inbox. Verify your emails are reaching the inbox with our SPAM testing software so you never toil away on emails that will get tangled in SPAM filters. Our sample report will show you how we can find deliverability problems before they happen. What issues have you seen regarding email file size and deliverability? 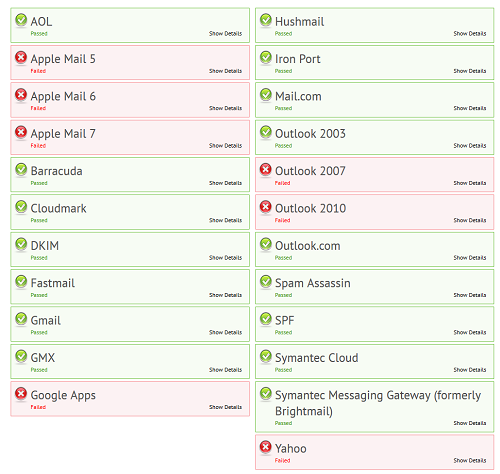 Have you done testing on SPAM filters and seen different results? We’d love to for you to comment below regarding the quirks you have encountered in the wild or the workarounds you’ve found along the way.